The Chevrolet Chevelle is a mid-sized car from Chevy, first rolling off the assembly line in 1964. 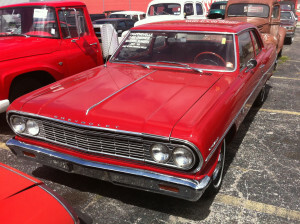 It was manufactured from 1964 through 1977 and was one of General Motors most triumphant cars. Chevelle models ranged from easy on the pocket family cars to convertibles and powerful coupes. The Malibu was at first the top trim level of the Chevelle line, and it replaced the Chevelle name entirely after 1977. The Chevelle chassis, based on the reengineered GM A platform, provided the platform for the Chevrolet Monte Carlo, a very successful model itself. The Chevelle was anticipated to compete with the equally sized Ford Fairlane, and to return to the Chevrolet lineup a model comparable in size and concept to the popular 1955-57 models. Early drawing photos show what would eventually be the Chevelle wearing Nova nameplates, the name that was used for the top trim level in the smaller Chevy II series. From 1964-69, the Chevelle was the groundwork for the similar Beaumont, a re-trimmed model sold only in Canada by Pontiac dealers. A two-door station wagon was available in 1964 and 1965 in the bottom-line Chevelle 300 series. Four-door hardtops, dubbed Sport Sedans, were available from 1966 through 1972. Two-door hardtops and convertibles were produced from 1964 to 1972, while four-door sedans and four-door wagons were offered throughout the entire run. In line with other Chevrolet series, the two-door hardtops were called Sport Coupes. An assortment of models of wagons was sold with exclusive nameplates: Nomad (1968-1972), Nomad Custom (1968), Greenbrier (1969-1972), Concours (1967-1972), and Concours Estate (1968-1972). The El Camino, a utility pickup, was part of the Chevy lineup and, depending on the year, was available in the 300/300 Deluxe trim level, Malibu trim level and the one-year only SS396. The El Camino outlived its passenger car counterpart until its end in 1987. The Chevelle underwent a redesign for the 1973 model year. The so-called “colonnade hardtop” styling featured frameless door glass and fixed “B” pillars. Rear windows on coupes no longer could be opened, no doubt encouragement from GM to purchase the increasingly popular optional air conditioning. The Front suspension was based on the Camaro and Firebird which greatly improved handling. Engine choices ranged from the 250 I6 to the venerable 454 V8. Hardened engine valve seats and hydraulic camshafts made these engines reliable for many miles, and allowed them to accept the increasingly popular unleaded regular gasoline. Cross flow radiators and coolant reservoirs that prevented air from entering the system prevented overheating. Swivel bucket seats and center console for automatic and manual shift cars were offered in every model as was the instrument gauge cluster. Power front disc and rear drum brakes were standard. Power accessories, air conditioning and AM/FM tape stereo were more prevalent these years and provided a pleasing drive. A power moon roof was an option in 1973 and 1975. The station wagon, available in 6 or 9 passenger seating, featured a rear hatchback door which allowed for easier entry and loading. The Chevrolet El Camino and GMC Sprint were based on the Chevelle. Yearly design changes to the front and rear mark the aesthetic differences as in preceding years. The 1973 to 1977 Chevelles were top sellers for GM as was the Oldsmobile Cutlass, which used the same A-body platform. The 1973 model offerings started with the top luxury Laguna series with its distinct urethane nose, followed by Malibu and then deluxe models. A Super Sport SS package was available for Malibu coupes and for the only time, station wagons. The Super Sport SS option included a black front grille, SS emblem on the interior and exterior, body side striping, rally wheels with white letter tires, F41 sport suspension with front and rear sway bars, and a 350 or 454 V8. A 4 speed Muncie transmission was available with 350 or 454 equipped cars on any model. In 1974 the Laguna S3 coupe replaced the “Super Sport SS” as the sporty performance option on the Chevelle. The nomenclature S3 referred to sport and 3rd generation Chevelle. It sported a special urethane nose, body side striping, Laguna S3 emblem, rally wheels, 4 spoke steering wheel and F41 sport suspension with front and rear sway bars. Radial tires on 15″ wheels and radial tuned suspension provided road grip and retractable 3 point seat belts were introduced and still used in new cars today. A 400 engine was new this year. The 454 was the top engine and available with the Turbo Hydra-Matic 400 or Muncie 4 speed transmissions. With the Laguna nameplate now bearing the sporty model in the Chevelle line, the top-line series for 1974 became the Malibu Classic, offered in sedan, coupe and station wagon models. Unlike the ’73 Laguna, the Malibu Classic used the same grille work as lesser Chevelle models but added a spring-loaded hood ornament. Inside, Malibu Classic featured luxurious interiors with notchback bench seats (or optional Strato bucket seats) upholstered in cloth or vinyl, carpeted door panels and wood grain instrument panel trim, and vertical opera windows on coupes or exterior wood trim on station wagons. Also for 1974, the base Chevelle Deluxe series was dropped, leaving the plain Malibu as the low-end series. The 1975 Laguna S-3 debuted as a 1/2 year model in February and sported a new sloped front nose designed for NASCAR. H.E.I. or High Energy Ignition provided spark to the spark plugs with minimal maintenance and increased power. The larger distributor cap also provided better high RPM performance by decreasing the likelihood of the spark conducting to the wrong terminal. The 454 and Turbo Hydra-Matic 400 transmissions was available for the first half of the model year and then the 400 was the top engine choice. In 1976, the Chevelle was available with the new 5.0 liter 305 V8 the 350 and the 400. 1977 offered the Malibu Classic as the top model and the 350 was the top engine. A Chevelle S.E. or special edition was available and provided front and rear spoilers, rally wheels, special graphics and sport suspension. Only 50 or so were built. When GM downsized its intermediate models for 1978, the Chevelle name was dropped and all models took the Chevrolet Malibu name. The 1973 to 1977 Chevelle was the top car in the NASCAR circuit in the 1970s. The car was so popular and successful on the track that Chevrolet developed a new front nose in 1975 that lead to the aerodynamic cars of today. The car dominated the field so much that NASCAR imposed a carburetor restrictor plate for all Laguna’s. Drivers that raced 1973 to 1977 Chevelles include Darrell Waltrip, Junior Johnson, Benny Parsons, Cale Yarborough, Bobby and Donnie Allison, Bobby Isaac, Lennie Pond, A.J. Foyt, Ricky Rudd, Dale Earnhardt and female racer Janet Guthrie.